WONDER WOMAN: THE TRUE AMAZON is Jill Thompson's storybook-style reimagining of the early years of the Amazon Princess Diana, who would grow up to become Wonder Woman. This fully painted original graphic novel is unlike any Wonder Woman tale you have ever read, told as only Eisner Award-winning writer/artist Thomspon could. When young Diana has the fawning attention of a nation, she soon grows spoiled. But a series of tragic events take their toll, and Diana must learn to grow up, take responsibility, and seize her destiny. 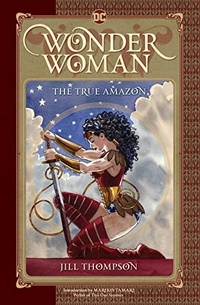 Steeped in the mythology of this iconic character's original conception, WONDER WOMAN: THE TRUE AMAZON is designed to appeal to a wide range of readers. It's a fresh, stand alone interpretation of the most famous and iconic female superhero of all time and the fulfillment of a dream project by one of contemporary comics' most acclaimed creators.